Imperial Dress Valance by Waverly. Jacobean pattern of blue, greens & yellows on a neutral background, fabric is 100% Cotton, for proper fullness use 2 to 3 times your window with in fabric. For wider windows use multiple valances. Valance is fully lined & has a 3" pocket & a 2 1/2" header for that custom look. The online shopping experience was awesome. There is a huge selection of curtains to pick from. The delivery was super fast (2 days) and the curtains were beautiful. Vivid colors, excellent quality of material, and the fit was spot on. I highly recommend Swags Galore. I love these valances. They are exactly as desribed. They are fully lined and the colors are just what I was hoping for. I bought three valnces and used one in my smalller window and the other two in the larger window. Delivery was also very quick. ProsFully lined, well made with quality material. I purchased these valances to complete the look of my newly redone sewing room. Waverly fabrics are well known to me and the lining and finishing at the hem was perfect. The quality of the workmanship was 5++ stars and they compliment my sewing room redo perfectly. As for the service I received from Swags Galore, it was also 5 stars. The website was easy to use, the ordering process was quick and simple, and the order arrived on time and in great condition. This is a company I will be using again as I have plans for more "upddating" in my home. I've purched before from Swags Galore and have never been disappointed. Website works well and delivery was quick. Ordering was easy, delivery came within days, and the waverly looks great in my blue bedroom! 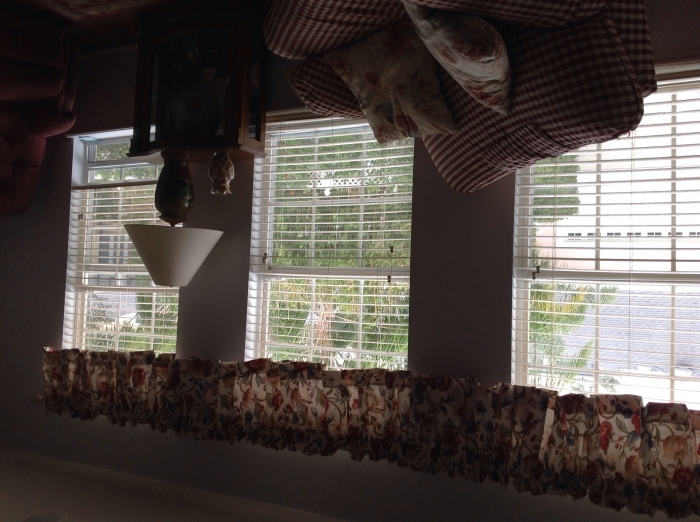 I was very impressed with the quality of these valances. Most valences are not as long as these are. They fit on my curtain rods with no problem and two of the valances were perfect for my picture window in my kitchen. The extra valance fit the window over my kitchen sink. The print is perfect and the yellow stands out to give the curtains a nice bright look. They are lined with fabric, not the heavy rubbery lining which I am very pleased about. I would purchase other curtains from Swags Galore if I needed them. so much to choose from. First time I have ordered from this company, and I am very satisfied. Love the curtains. Beautiful colors and look great! Easy to order. Great selection and received them quickly. They were delivered promptly and are a nice quality fabric for a great price! The product was just what i wanted. Sent it right out! Great service & great product ! I am very happy with this valance The website was easy to use. The fabric is a heavy quality the way I pictured it. .Delivery was on time. I am delighted and would recommend your company to others. I needed a valance to put atop lace panels in a bedroom painted blue. The are perfect! The pattern is exactly what I was looking for and blue matches the paint on the walls. The fabric is that Waverly cotton with a glossy sheen. They look wonderful on my windows; seems they were made just for me! I highly recommend them. I am very pleased with these valances. Very good quality and I love the blue and white and yellow color combination. ProsWashable. Yeah no dry cleaning! I did not want to spend a fortune on custom made valances for my bedroom. These valances were reasonably priced and look custom made. The fabric is high quality and the colors are vibrant. My experience with Swags Galore was great. The valances shipped when promised. I have now purchased valances for my kitchen based on my pleasant experience with this company. The fabric is a good weight, so the valance hangs well. It is extra full, so gathers on the rod nicely. The colors are vibrant and worked well in my room. The order came extra fast. I ordered one night and the order was shipped the next day. Really fast service. This item was a great finishing touch to my bedroom remodel. Completes our "Beachy Livingroom".....Compliments the solids and stripes in our furniture....VERY VERY HAPPY! Very well made and it looks very nice. Thanks for having such a great selection on your site. I was very happy with how quickly the order was shipped and the quality of the curtains! Beautiful valance, even better than described. Details are wonderful: fully lined, edged in coordinating bias-striped fabric. They look great! Very Pretty and Very nice quality. Could not believe they were shipped and received in two days. GREAT PRODUCT!! These valances look great with my solid yellow bedspread. Couldn't be happier; order arrived quickly. Very satisfied. Shipping was quick and easy, the valance is very pretty. I wanted something to offset the green cabinets and still blend in together with the colors. Love it!